This is North India’s favorite food during Winters. Made of Mustard greens, this saag is rich in vitamins and minerals and also calories (due to butter and ghee)….. Traditionally eaten with Makki ki roti, this saag is sure to bring food induced Nirvana to any Punjabi (except my hubby though, who is more of a gujarati than Punjabi ;))….And after Bollywood endorsing this dish big time, everybody in India is curious about it. Again i understand (though i am not very sure) that it is made differently in different households. I make it the way my MIL makes it, with a little time saving modification. So here is the recipe…. 1) Clean the Mustard greens. How you do it is very important. 1st you take leaves along with tender stems. After that you have 2 options, either you throw away the bigger stems or you peel them and cut finely and use it. I go for the 2nd option as that way the taste improves, but it takes a hell lot of time to peel the stems. If you are strapped for time then you can go for option 1. 2) Clean the Spinach leaves. Mix them with Mustard greens and wash properly 4-5 times or till you feel they are clean. 3) Then after adding water to the leaves, pressure cook the leaves for 4-5 whistles on low flame. My MIL cooks it covered in a pan, but it takes 2-3 hours for the sarson leaves to get cooked. so i go for pressure cooking which is faster. I personally don’t think it makes any difference to the taste. 4) Let it cool down and then grind together in a coarse paste in your mixer and transfer in a pan. 5) Cook it in the pan covered for 10-15 minutes. 6) Now add the 2 tablespoon of corn flour and salt in proportion of the paste and cook again for 20 minutes while stirring in between. 7) In a pan, take oil for tadka and heat it up, add finely cut onions, finely cut green chili, finely cut ginger and finely cut garlic to it. Add salt to the proportion of onions. Saute till the onions turn translucent. Add garam masala. 8) Add this tadka to the mustard green paste and mix thoroughly. Add 2 tablespoon butter or ghee. 9) Simmer it for 5 minutes and you are ready to serve the saag. While serving add a tablespoon of ghee or butter. 10) For makki roti, knead the dough by mixing makki aata, salt and water. 11) Now rolling Makki roti is a difficult task. To get unbroken rotis, i use a wet kitchen towel and roll small makki rotis on the towel (my neighbour and friend V taught me this trick and it works like a charm). To take the rotis off the towel take the towel in your palm and turn it over to put roti in your other palm. Then on the hot tawa make rotis like regular rotis. Apply ghee or butter. 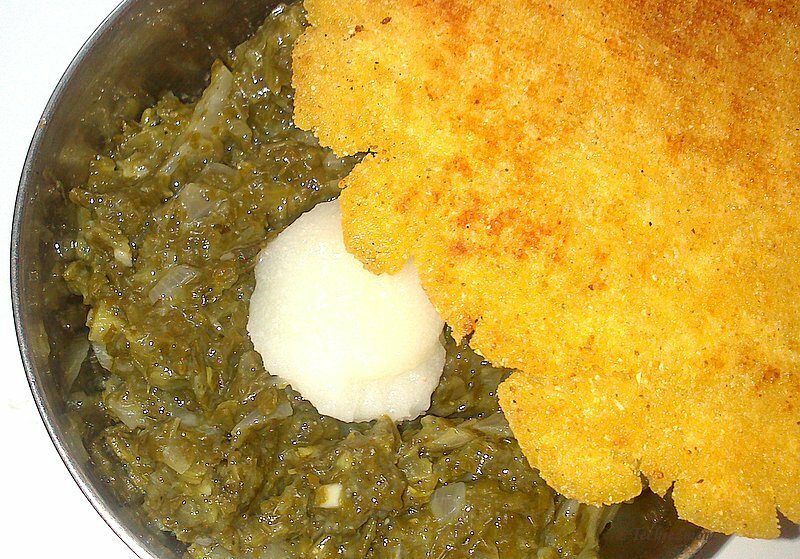 And Enjoy Makki ki roti with Sarson ka Saag…. Thanks Nilu 🙂 This is a great winter food!! i also prepare in same way….looks yummy….its perfect for winter. Great to know that your way is similar!!! Yes, the saag tastes great in winters!! !